This 2-CD set is part of Naxos�s �Classics Explained� series, which includes other items such as Bach Brandenburg Concertos, the �Pastoral� Symphony, Ravel�s Boléro and so on. The intentions behind the series are unimpeachable, but the question immediately arises, do such very well known pieces actually need �explaining�? With a work such as the aforesaid Ravel, the very fact of its supreme popularity surely suggests that it does not, that the musical public have understood it very well. I can think of plenty of music that does need the help of some explanation to the uninitiated � mainly 20th century works but not all � but, in the hard realities of the record industry, these works probably wouldn�t shift enough copies to make it appear a worthwhile effort. What I really hope is the intention is to maintain the series, and gradually venture into more uncharted waters. If so, it will surely develop into an extremely valuable resource. And maybe this issue, tackling a hugely popular yet immensely complex 20th century classic, is the herald of just such an approach. 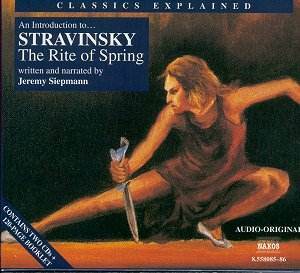 Nobody contests the view that The Rite of Spring is a key work, perhaps the key work of the early 20th century, and offers a violent introduction to the harsh new world of modern music. That much can be gleaned from simply knowing the date of its composition before hearing a performance (preferably live). But many intelligent music-lovers will then ask themselves a host of questions. Why did the composer feel the need to compose such music? Where does it come from? How exactly did it attack the then existing language and concept of music? And so on. How far does this issue go towards answering such questions? Jeremy Siepmann certainly makes a brave effort. He is a sensitive, intelligent musician, and an experienced lecturer, though he does make one or two odd careless errors. On track 34-35 of CD2, he discusses a motif he tells us is introduced by the horns, which is incorrect as it is played by trumpets. In track 35, he then says �And that�s it, as far as this particular motif is concerned. We never hear from it again.� How odd, then, that the same motif crops up in track 36, this time correctly ascribed to the trumpets. And it appears yet again in track 38, where Siepmann even manages to play it incorrectly in his piano example! This sort of confusion can at best cause befuddlement on the listener's part, and at worst undermine confidence in the speaker. That fortunately, though, seems to be the only serious error in Siepmann�s discussion of the piece. The real problem, however, is a presentational one, in that, instead of talking intimately or informally, Siepmann lectures. Not unpleasantly, or even particularly patronisingly. But he does deliver his text in what I can only describe as a �newsreaderly� manner that makes it sound, oddly, as if he were reading somebody else�s script, not his own. After a while, this becomes wearing, and I found my attention wandering during the many explanations of Stravinsky�s layering of ostinati or his use of tonal ambiguity. Occasionally, things buck up considerably, as when Siepmann describes the �Glorification of the Chosen Victim�, likening his first encounter with this terrifying music to the news of the Kennedy assassination, or the 9/11 disasters. Indeed, were the discussion to begin from that point, i.e. from the intensity of a personal experience, I believe that most music-lovers would be hooked right away. Nevertheless, Siepmann persists right the way through, subjecting many passages to a rigorous analysis, much of which will, I fear, go way over the heads of many listeners, though others may well be interested enough to delve further, and use this exploration as a launch-pad for their own in-depth investigations. I�m sure that is what Siepmann and the Naxos team hope will happen, and I too hope that they are proven to be right. CD1 concludes with Part 1 of the ballet complete, similarly CD2 with Part2. What of the performance? It is a worthy rather than a thrilling one. The recording is clear enough to allow most of Siepmann�s points to be heard fairly easily (if you are quite sure what you are supposed to be listening for!). But, in truth, it is a pretty tame version, and might make one wonder here and there what all the fuss is about. Then again, nobody can fully comprehend the Rite until they have heard a fine live performance, and that�s a point I should like Siepmann to have driven home. Despite my reservations, I really wish this project well. Naxos�s launch of the series is timely, when musicians are becoming belatedly aware of the need to go out there and present and explain great music in ways which will attract more listeners to it. I just wonder if they would be better off letting Jeremy Siepmann prepare the text, and find somebody else to actually deliver it. Or alternatively use two presenters, and do the whole thing as a conversation, which would be much more listener-friendly, and a great aid to concentration. But I look forward to more issues in this enterprising and potentially important series.